If your dog has health problems that may be related to a food allergy, it's a good idea to try switching to hypoallergenic dog food. The good news is that the symptoms are likely to go away once the substances to which your pet is allergic are removed from his or her diet. In response to the growing demand for dog foods that are free from substances likely to trigger canine allergies, a number of pet food manufacturers have developed hypoallergenic formulas that are less likely to aggravate intestinal distress or skin allergies. Hypoallergenic dog foods are available from a variety of resources including veterinary health care facilities, stores that specialize in pet care products and a variety of online retailers. Available hypoallergenic food products for canines include the following brands. Addiction Pet Food is made from a formula that is both holistic and hypoallergenic. The formula is free from all fillers, meat by-products, harmful additives and preservatives. Addiction brand animal foods are nutritionally balanced and made with recipes designed specifically to promote vitality and wellness in pets. Hills Prescription Diet makes hypoallergenic pet food and treats formulated specifically to avoid triggering many types of common canine allergic reactions. Holistic Blend manufactures a variety of hypoallergenic and organic pet foods and treats. The company also carries a full line of supplements designed to promote optimal pet health. Nutro Ultra Holistic dog food is a good option for dogs with beef allergies. The protein in this premium, all-natural dog food is a combination of salmon, chicken, and lamb. The Honest Kitchen manufactures dehydrated raw organic pet food that is 100 percent human food grade. The company's all natural line of pet foods is made with organic grains and meats that are free from hormones and antibiotics. If you suspect your dog has food allergies, the first thing you should do is change his or her diet. 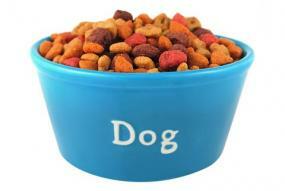 Switch your current brand of food to a high quality, hypoallergenic dog food. You might want to ask your vet or a professional at your local pet supply store to recommend particular food brands or formulations to try. The best way to determine exactly which ingredients trigger allergies in your pet is through a process of trial and error. By seeing how your dog reacts when certain food items are eliminated from his or her diet, you can figure out which substances trigger allergic reactions. It's a good idea to start out by purchasing hypoallergenic foods free from beef and corn. If symptoms don't show signs of improvement within a month, try eliminating another common allergen. When your animal's symptoms subside, you'll know that you have figured out the problem. Keep in mind that many dogs suffer from multiple allergies, so keep a running diary to help you keep track. Don't allow your dog to eat table scraps or other forms of people food, particularly while trying to identify or rule out specific allergies. Be sure to consult with your veterinarian to rule out other health problems, particularly if your pet's symptoms don't diminish significantly within a few weeks of making a dietary change.